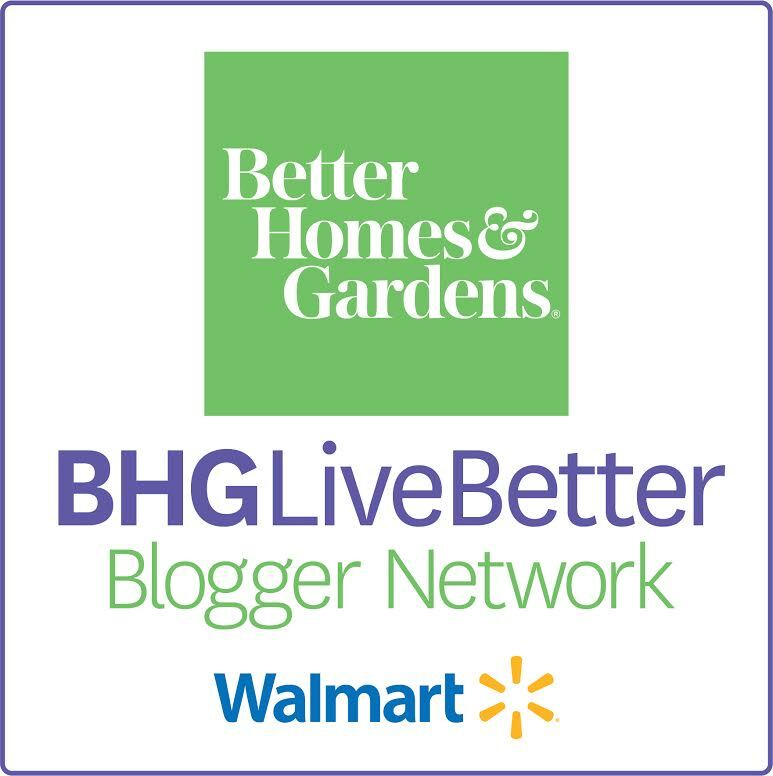 Thanks to Better Homes and Gardens at Walmart for sponsoring this post. This post contains affiliate links for your convenience. The spring like weather in south Alabama has been so warm and beautiful, I’m not mad about that at all! It has inspired several outdoor projects. We are working furiously on our back porch, we had a roof put over the patio and Barry and I are currently building an outdoor kitchen. While all the dirty work is going on back there, I did a little refresh in this corner of our farmhouse porch. The new line of farmhouse furniture by Better Homes and Gardens at Walmart was my inspiration for this makeover. I have been wanting these metal chairs since I saw them last year while visiting Better Homes and Gardens headquarters. 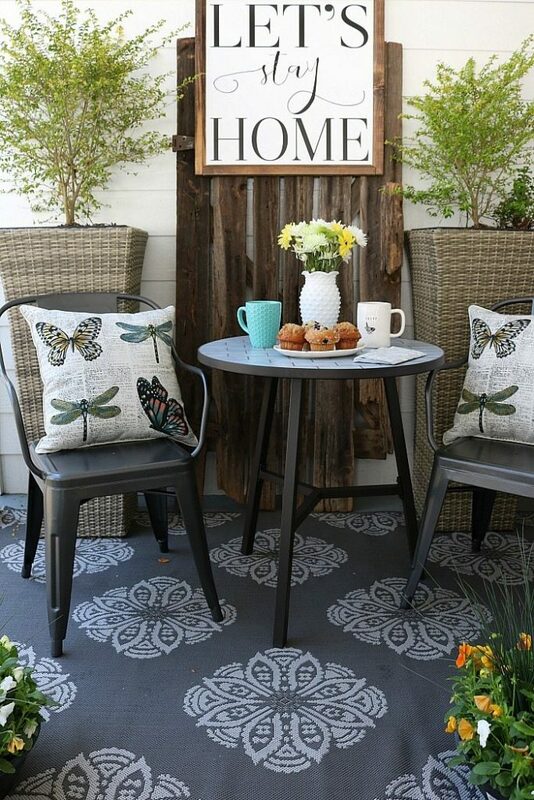 This is the perfect spot on the porch for morning coffee or happy hour. It’s tucked in the corner and the siding reminds me of shiplap. We moved here in the middle of December and every area of the house inside and out needs something. I am slowly working my way around! Here’s what I did to refresh my area. Start with a clean blank slate. Art – I propped a barn wood door against the wall and added a quote sign that I got for Christmas. I’ve had this old barn door/gate forever and I try to use it everywhere. It’s definitely a statement piece. Instant farmhouse charm and it breaks up the white wall. I am loving everything about the space, but those Camrose Farmhouse industrial chairs are my favorite! 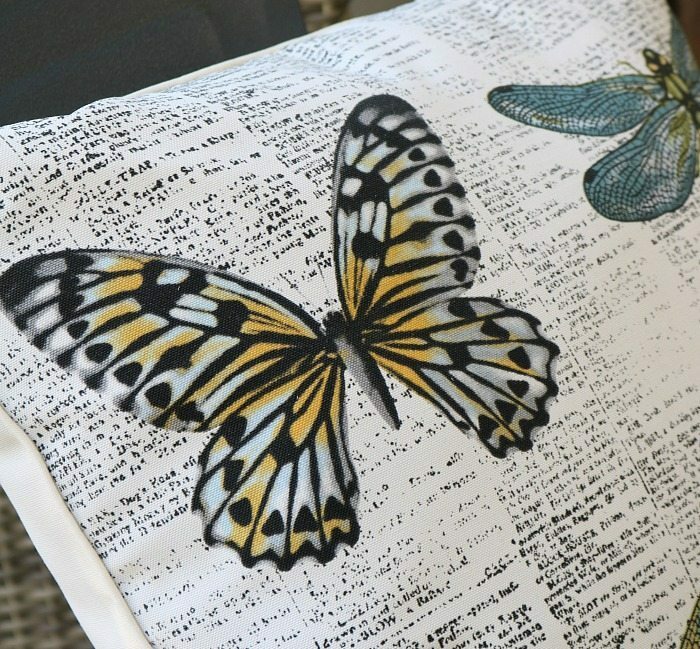 Love the details of the Better Homes and Gardens outdoor toss pillows. They have several in stores to choose from. 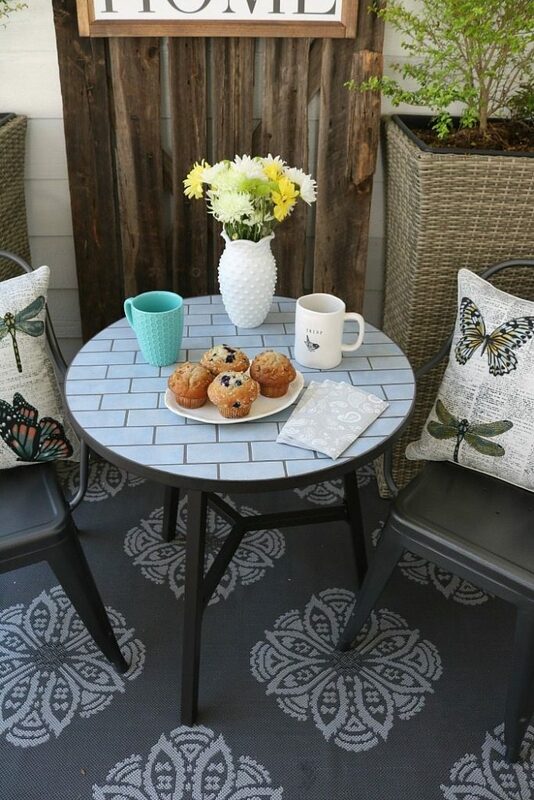 And the Better Homes and Gardens Camrose Farmhouse subway tile table top is a great weight and the perfect bistro size for my space. 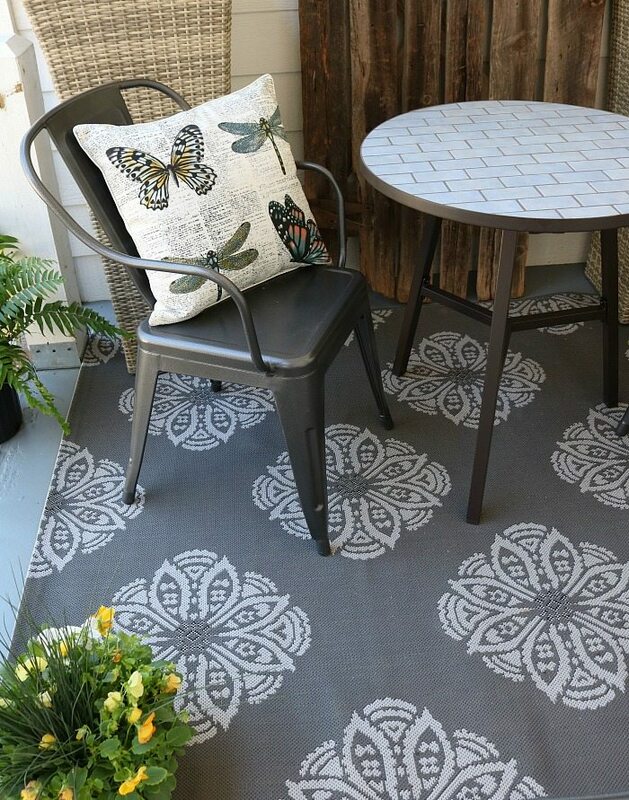 I grounded the space with this gray medallion indoor/outdoor rug, it’s not new but it looks like it is. I had it on our deck in the last house. It’s easy to clean, just spray it down with the water hose if needed. 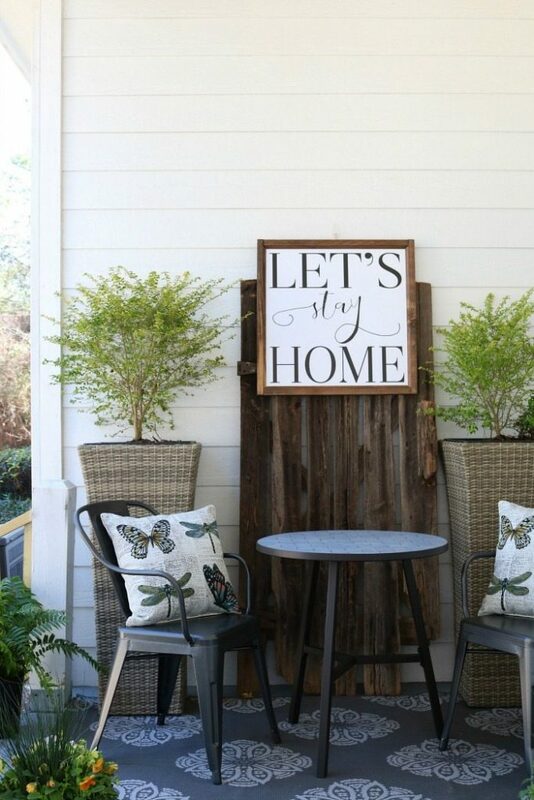 I love the idea of a porch as cute as this and weather good enough to sit out on it. 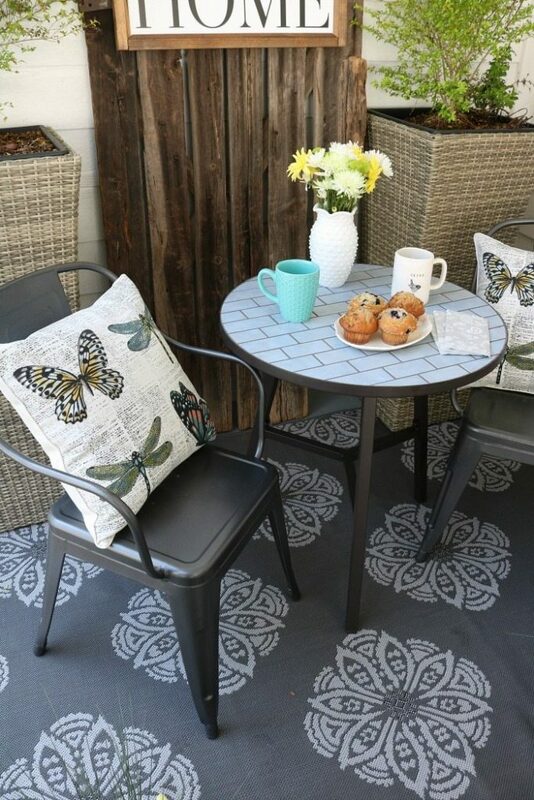 In the UK here we really don’t have porches at all, we might have a patio area out the back if we are lucky for sitting out on those odd few lovely days we get each year! Nice furniture! Awesome! Thanks for posting this. What a great little space to cozy up with someone special Debbie! I love everything, including the artwork hanging on that yummy old gate! The colors are so relaxing (for me) You always make everything look so inviting in your home! Beautiful and it feels so relaxing! I love what you have done with the porch area. I am just north of Atlanta and the daffodils are blooming. Can’t wait for Spring. 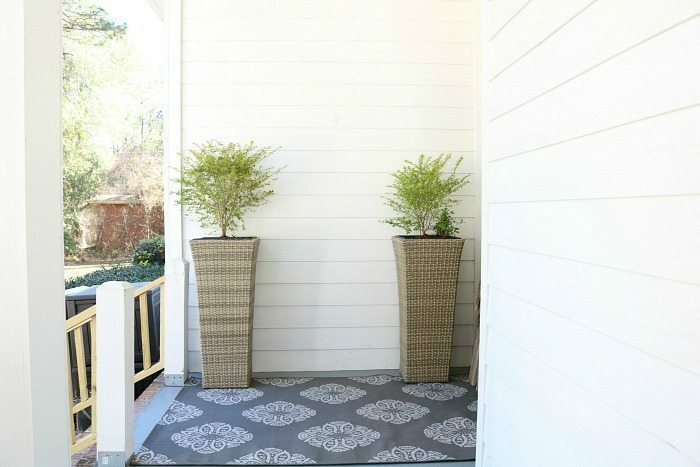 Can you tell me where you found the wicker planters? Hi Jan, I bought those wicker planters a few years back at TJ Maxx! Thank you! 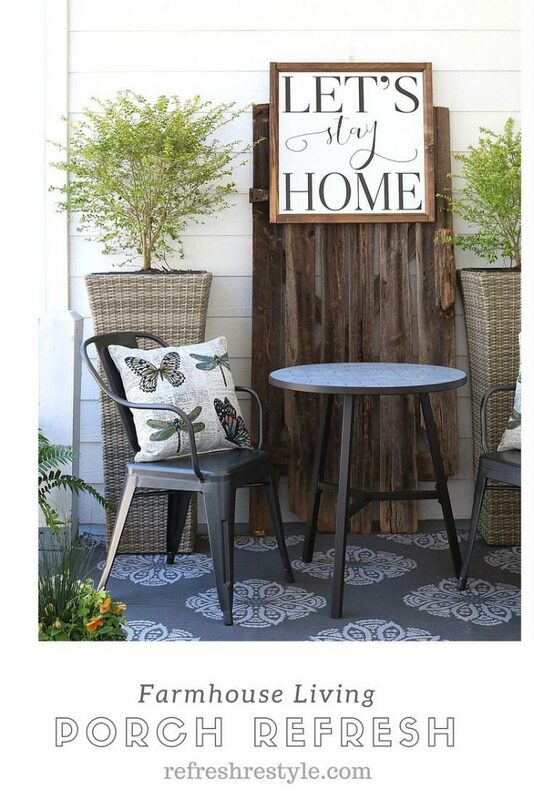 Your farmhouse/industrial porch furniture looks great. 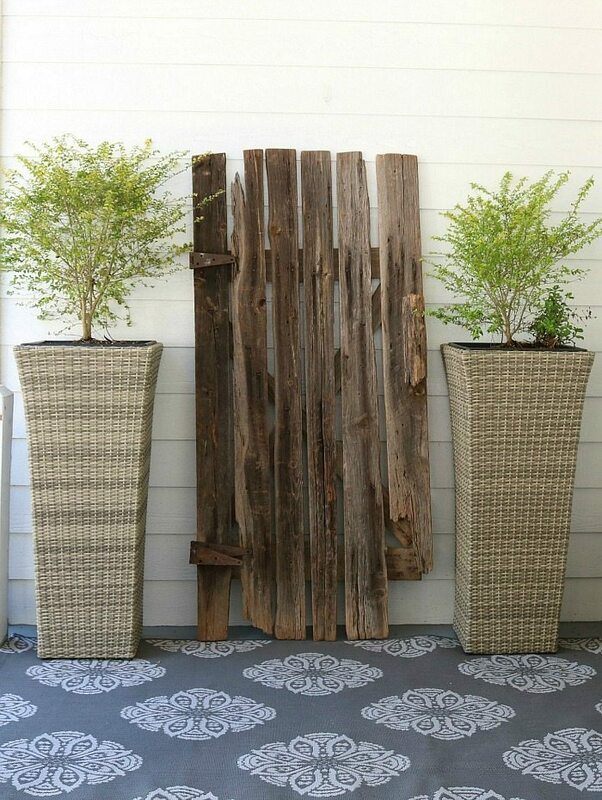 I especially like your wicker/woven planters. Along with the vintage door, they make a great backdrop for your seating area. 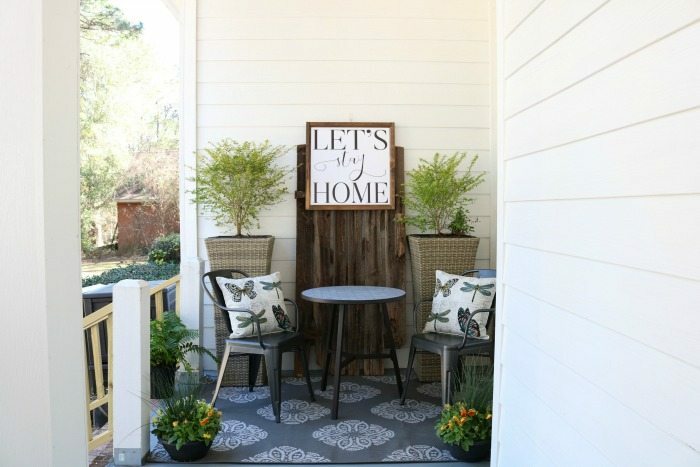 Looking ahead to back porch living! So pretty and oh so welcoming! Love it! 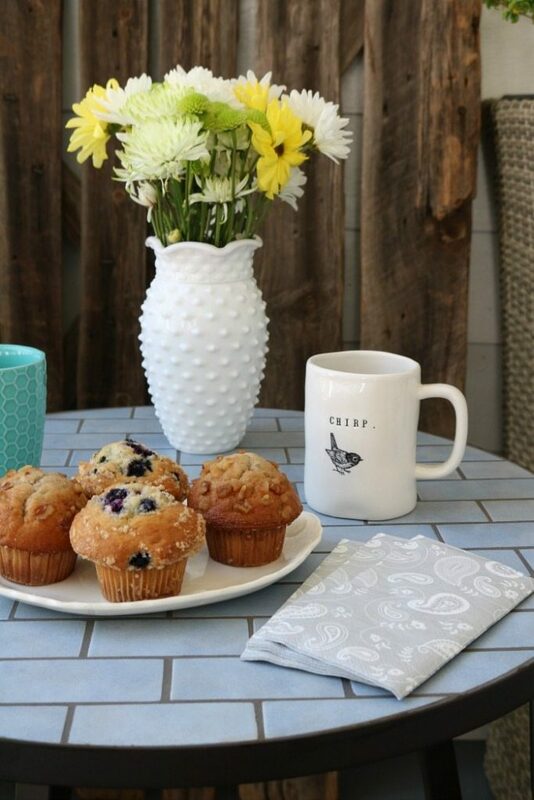 That tabletop is so darn cute, love the details. Your video is just adorable as well! Great work! Thank you!! Yes, the bistro table is awesome! Debbie it looks delightful!! 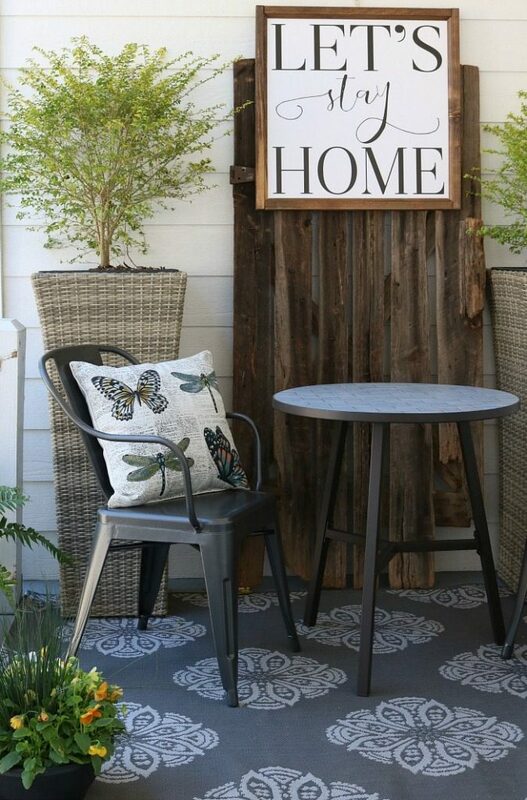 Love the backdrop for your art, those tall urns.. and of course the bistro set. Those Camrose chairs are so cute. I want a set of four in every color. lol! !